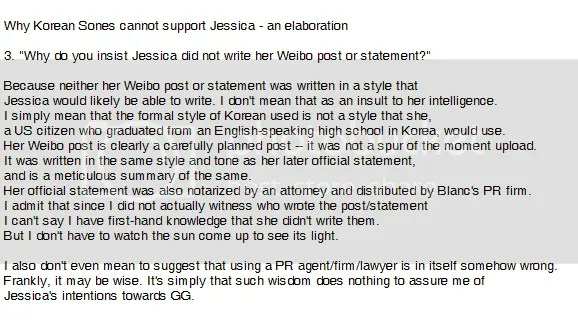 This is in relation to the previous explanation of what K-sones know about the issue. 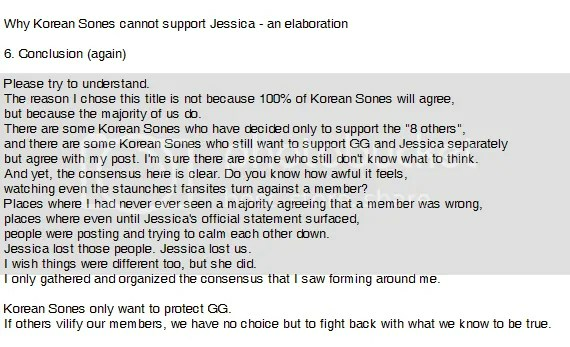 written and elaborated by @crucial_gg (from Twitter), a K-sone. 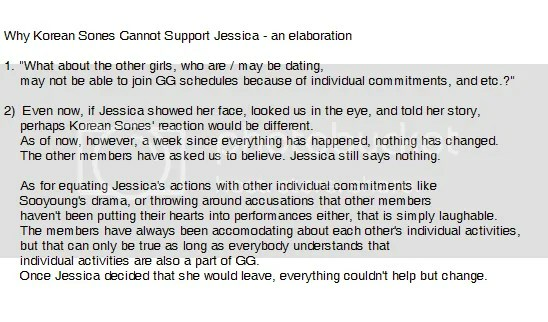 So my question so do you think all of girls know about jessica leaving them ? 1.Cause once fany play truth game that the result she dont like her in jekry onstyle. 2.Sunny wrote long message in her last twitter 28 aug 14 if not mistaken. 4. Seohyun cry really hard like she just knew the news at shenzen fanmeet cause before fanmeeting she looks happy with taetiseo perform in 28 sunday for 1 event if not mistake. 5. At 30 sept in morning hyo look trebelly sad with her arm clenching as i see in photo airport to shenzen fanmeet. Hope you can give me so explanation for this question. So in addiction are all girl know about this or just certain member knew about jessica dream in acheive her this job, cause by my point 4 and 5 look like hyo n seo hyun look like just knew about it. 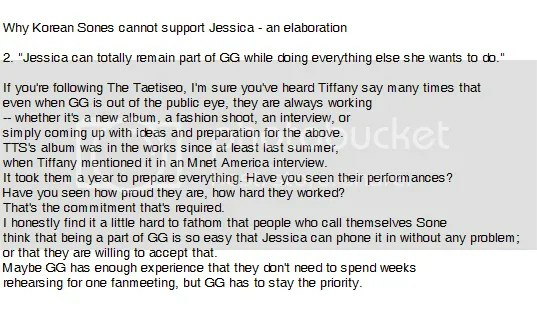 It’s clear that all 8 knew that Jessica was planning on leaving SNSD to pursue her new interest. With all the discussions and meetings going on, all of them must have sat down with the higher ups of SM to talk about this. They would’ve known about J’s plans to start up B, and they definitely would’ve known about J’s r/s with TK as well. And they probably knew this since the beginning of the year at least. The mystery lies in what went down BTS, leading up to J’s disclosure on Weibo on 30 Sep 5am. What led her (PR agency) to make the decision to publicize it on that day. It is clear that SM was not prepared. They could only respond to reporters with a “I’ll get back to you after I check things out” reply and it took them hours before they could get an official statement out. So if SM was not prepared, I don’t think any of the girls expected J to announce the news and not turn up for Shenzhen. I don’t think we can use pictures to analyze this however. Pictures only capture a single moment, less than a second long. Only the fans at the airport would’ve seen what the girls looked like and how they behaved. As for Seohyun crying, well, all the girls were crying. I think sones focused more on the maknae in this case because it seemed she cried harder than the other girls. But all of them were crying. Some may be better at holding in their emotions than others. So to answer your question, yes, the 8 definitely know about J’s future plans but no, they probably didn’t expect J to announce it that way on that day, nor did they expect J to skip the Shenzhen fanmeet.